Ohio chalks up another key capital investment win for luring new businesses in 2008 and helping existing companies expand. he Ohio Department of Development (ODOD) joins Gov. Ted Strickland's office in claiming a key economic development award for previous-year capital investment performance. Just a few short weeks after participating in a ceremony at Cardinal Health's newly expanded Columbus-area campus, where Gov. 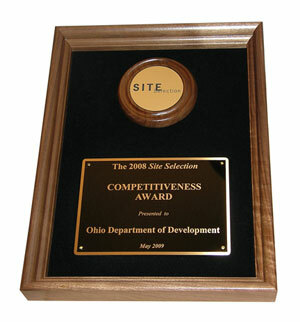 Strickland accepted Ohio's third consecutive Governor's Cup Award (see the March 2009 cover story), ODOD has won the 2008 Site Selection Competitiveness Award. This recognition goes to the state-level economic development agency that accumulates the most points across 10 criteria that measure business-expansion activity; the criteria are based on project data tracked by Site Selection publisher Conway Data's proprietary New Plant database. This award is separate from the Top Groups recognition (see page 314) in that only state-level agencies are eligible. 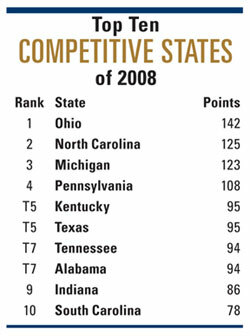 To qualify in a given category, a state must finish in the top 20, at which point it is assigned points according to where in the top 20 it ranks – 20 points for first place, 19 for second place and so forth. Ohio finished with 142 points, which is a 40-point increase over its fifth-place finish the previous year. North Carolina finished second with 125 points and Michigan placed third with 123. Number of 100-plus-job projects per 1 million population in 2008. "This is a testament to Lt. Governor Lee Fisher, because he guided this [economic development office] ship for the first two-plus years of the administration," says Mark Barbash, ODOD's interim director. Barbash left his post as economic development director for Columbus, Ohio, to join Fisher's team at ODOD when the new administration came to power in early 2007. Barbash's background is in economic development and finance, with experience in investment banking, the Cleveland mayor's office and with the Washington, D.C.-based National Development Council, a non-profit organization which champions capital investment in rural and urban areas. Fisher's background was just as beneficial in his leadership of Ohio's economic development team, adds Barbash. A former state attorney general and state senator, Fisher ran the Cleveland-based Center for Families and Children for several years prior to becoming Lieutenant Governor and head of ODOD. "He has a strong legal background and is very well grounded in what economic development means on the ground for people, and that was a great thing for the state," says Barbash. "He did not take that job to be a figurehead. He took it because he had something to contribute." Fisher resigned as director of ODOD on Feb. 17th to pursue a run for former Gov. George Voinovich's U.S. Senate seat in the 2010 election, at which point Barbash assumed the reins of ODOD. A combination of factors made ODOD as effective as it was in 2008, says Barbash, not the least of which has been Governor Strickland's leadership. His vision, as embodied in ODOD's new strategic plan, identifies target industries, target partnerships and target outcomes. The result is more effective use of development resources. Barbash next points to the importance of a positive attitude, especially in trying economic times. "Even though the economy is tough, we have worked hard to make sure that it doesn't get us down," he explains. "That translates into being very proactive in strategic ways. For example, we participated for the first time in the American Wind Energy Association [www.awea.org] exhibition and the BIO show in San Diego – we were much more proactive in our sales and marketing activities both outside and inside the state. We met one-on-one with business leaders in the state to identify needs and problems and found ways to solve them. That is particularly important with the economy as tough as it is." Barbash says ODOD's toolbox is good but limited, making it more important than ever to be creative in its dealings with the business community. The state's Rapid Outreach Fund, for helping to close capital investment deals, was about $11 million in 2008, and that will not change significantly. But some new programs bear mentioning, including the Innovation Ohio Loan Fund and the R&D Loan Fund. "Repayment of the R&D loans is based on performance, and the Innovation fund is for even earlier in the process," says Barbash, adding that Ohio's Third Frontier program for expanding the state's high-tech research capabilities – now in its seventh year – is going strong. "Another program is our Job Ready Site Fund, which other states also have, that is designed to be the leading edge for site development so communities can have a prepared site when businesses come looking." Another factor is ODOD's strong partnership with local and regional economic development groups. "The Governor's Cup is a representation of that partnership," says Barbash. "We believe in making that partnership work, even to the point that we have put some things in our strategic plan, such as developing regional deal teams to encourage empowerment at the local level." These teams will play a key role in what Barbash calls "signature, game-changing projects" that require not just economic developers at the table, but higher education officials, work-force development personnel and local business leaders who can help tell the story of doing business in Ohio. Governor's regional representatives had been in place around the state, but the new administration elevated those positions to economic development professionals. These officials' job is to bring the right players to the table and keep the project location process on track. Keeping Cooper Tire in Findlay is a recent example of that teamwork, says Barbash. ODOD staff was also a factor behind the agency's success in 2008, notes Barbash. "The level of activity and professionalism immediately went up when Lee Fisher came on board," he relates. "The standards he set were extremely high." Among those standards is an ability to educate, to counter perceptions about doing business in a Midwestern industrial state with the reality that is Ohio, particularly with respect to corporate taxation. "We led with tax reform," says Barbash. "When we are pricing out our incentive packages, we make a point of telling the story about that. Does it help when you're putting incentives together state to state? It helps when making the point that Ohio cares about business, and that's the reason we did tax reform. "We eliminated the personal property tax on inventory," he explains. "And people tell us we can't count that as an incentive. But we tell them to look at the tax they would be paying in another state, which would have to provide an abatement to get rid of that tax. Well, we actually got rid of that tax." The Rust Belt State perception hasn't vanished altogether yet, says Barbash, but it's evaporating as more businesses understand Ohio's work force and lifestyle attributes in addition to the pro-business measures taken in recent years, such as tax reform passed by the previous administration. "We win many more times than we lose," says Barbash. "We can't know about the projects that don't call Ohio, which is why very proactive marketing is so important to us." Projects that do call ODOD seeking a possible location will increasingly hail from the renewable energy sector, the importance of which was outlined in Lt. Gov. Fisher's remarks in the Governor's Cup article in the May 2009 issue. "The Renewable Energy Portfolio Standard [signed into law by Gov. Strickland in May 2008] is making us a very competitive state for advanced energy – wind, solar, geothermal," says Barbash. "We are being looked at seriously by OEMs around the world, and it is creating an opportunity for auto parts suppliers in particular to make the transition and diversify their customer base. That is a very important part of the story of Ohio." As for 2009, a continued focus on retaining investment in Ohio will play as prominent a role as attracting new investment does. "When I talk about Ohio winning the Governor's Cup again, I make the point that the larger percentage of projects in 2008 was existing businesses expanding," says Barbash. "It's a tough economy and will continue to be, so we need to support our existing businesses. When we come out of this particular economy, they need to be strong."